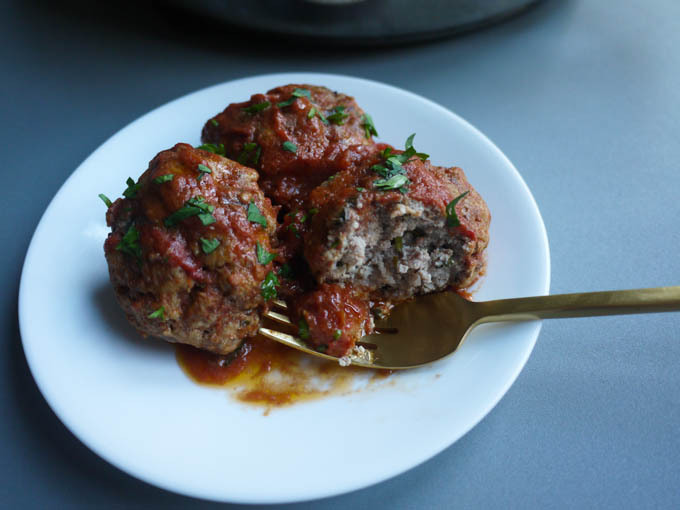 Juicy, flavorful meatballs made with ricotta and parmesan cheeses instead of breadcrumbs and Marcella Hazan's classic tomato, butter and onion sauce. 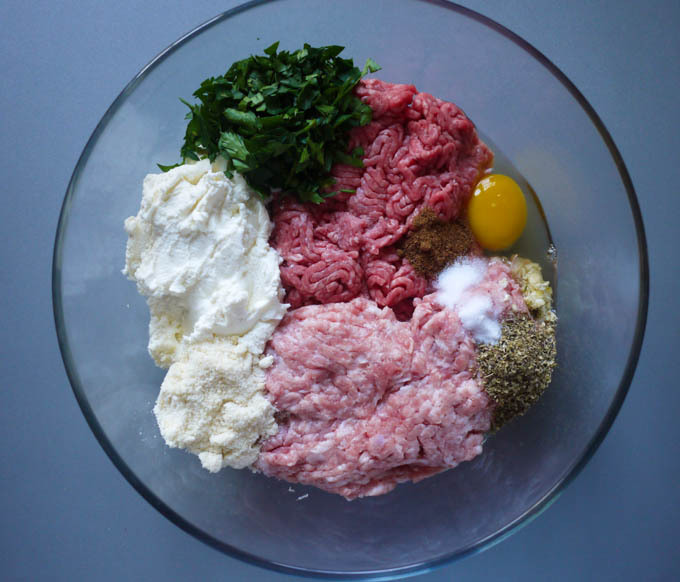 In a large bowl, combine beef, pork/veal, ricotta cheese, egg, parsley, garlic, parmesan cheese, oregano, nutmeg, salt and pepper. 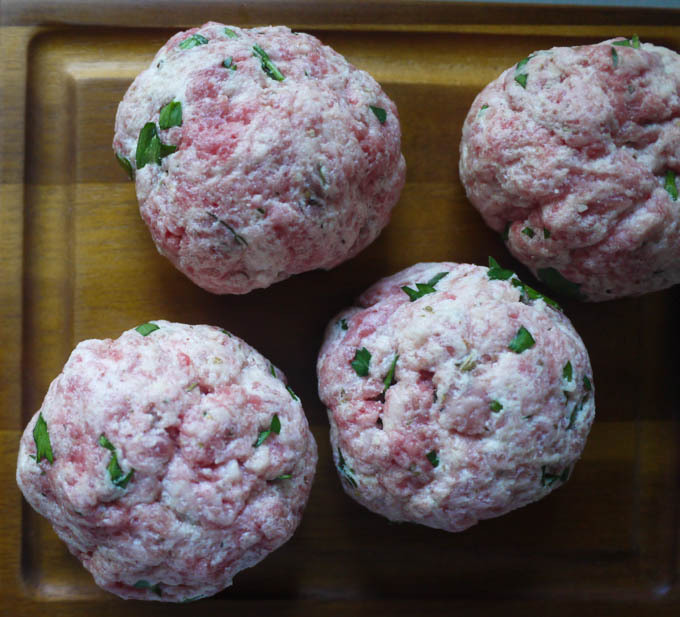 Roll into large meatballs about the size of your palm. I usually get about 13 meatballs. Pour oil into a large pan and swirl to coat the bottom of the pan. 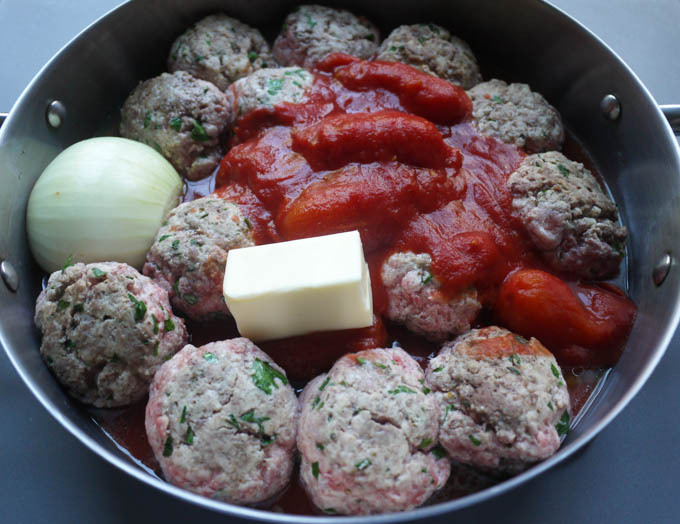 Place meatballs in the oil and flip them over a few times so that the entire surface of the meatball is coated in a little oil. Lightly brown both sides of the meatball on medium heat. Add tomatoes, butter and onion to the pan. Cover and cook on medium heat for 15 minutes. Uncover, raise heat to medium high and cook for an additional 15 minutes, stirring occasionally to break up the tomatoes. 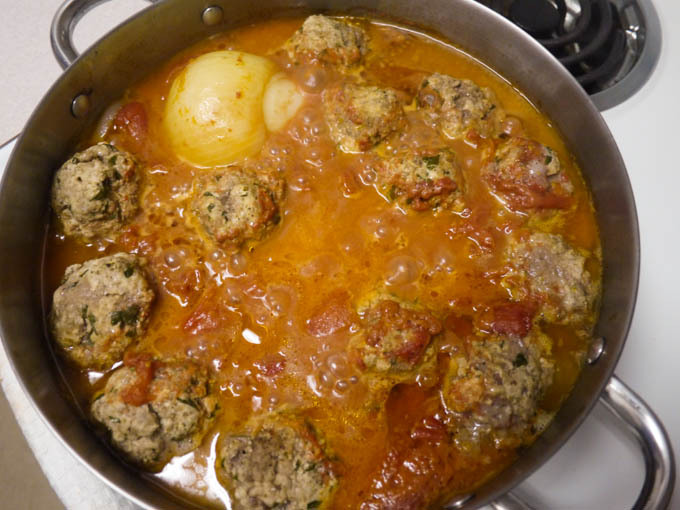 Place meatballs in the oil and flip them over a few times so that the entire surface of the meatball is coated in a little oil. Don’t you hate when you put oil in a pan, brown something on one side, go to flip it over and realize the pan is now dry as the Sahara Desert? 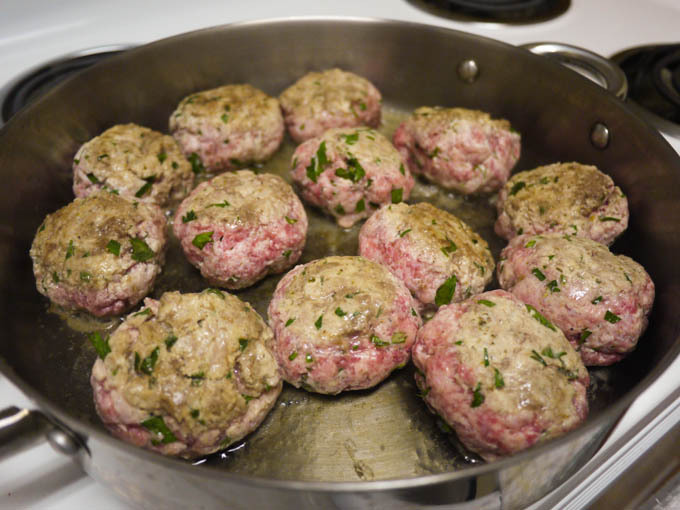 This step takes care of that by pre-coating the entire meatball with oil. Lightly brown both sides of the meatball on medium heat. Normally, I do not fry meatballs. I put them straight into sauce or broth raw. I fry them here because the sauce I am making with them is on the dry side (not a lot of liquid) and I want to make sure that they are cooked without burning the sauce. Add tomatoes, butter and onion to the pan. As you can see, you don’t need to cut up the onion. It’s there for flavor. 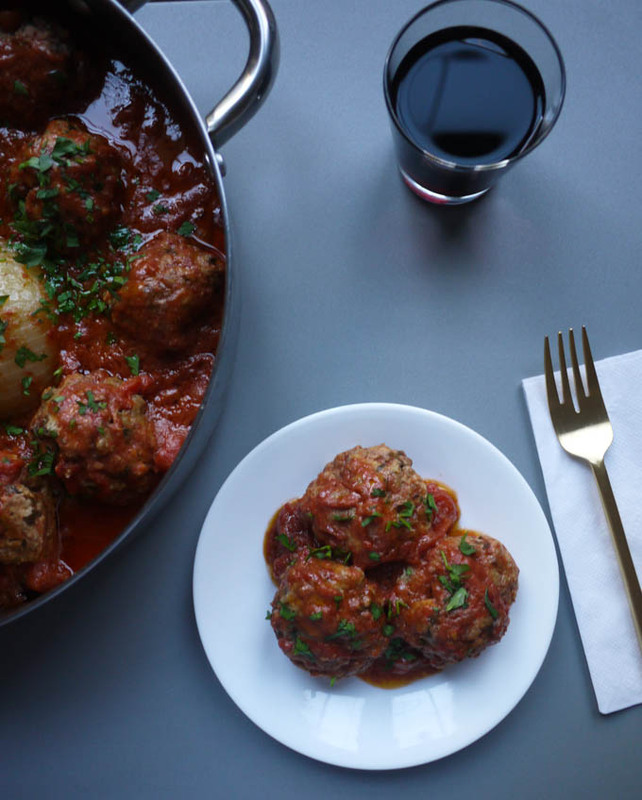 These juicy meatballs and rich, velvety tomato sauce are perfect all on their own. I am SO making these this weekend…I love that onion & butter tomato sauce, and it’s been far too long since I’ve had it. 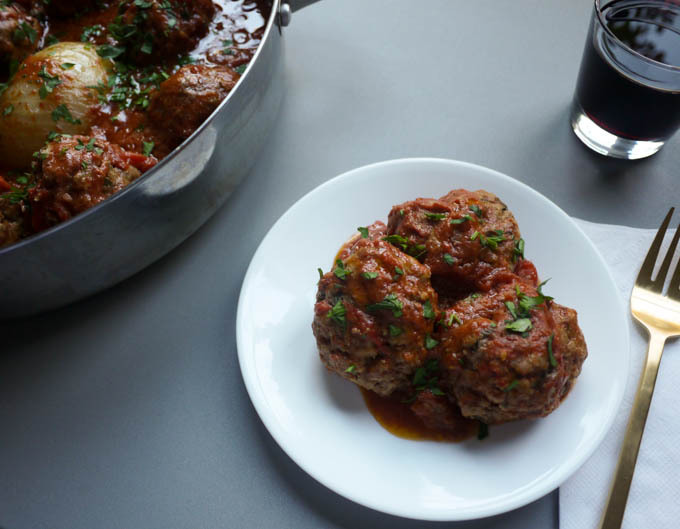 And I’m curious to try ricotta meatballs–I’ve only ever used Parmesan in mine before. I’m printing the recipe right now to make this dish for dinner. can’t wait to taste it!! Will take pictures. I made the Ricotta Meatballs with Tomato, Butter and Onion tonight for dinner and it was to die for. They were full of flavor, tender, and delicious. The aroma that came from mixing the ingredients together was wonderful. How did you know nutmeg would add such flavor to the meatballs? Dad ate two meatballs and I had one. I served it with DeCecco brand Linguine. Everything about this meal was Magnificent! Thanks for another award winning recipe.